The Duke Nukem Forever Balls of Steel edition has been announced, a big brassy box that includes postcards, stickers, a hardcover book, a numbered certificate of authenticity and a whole bunch of other stuff that'll make you a sure-fire hit with the ladies. 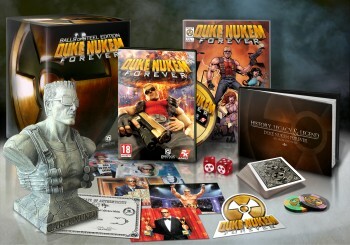 Was there ever any doubt that Duke Nukem Forever would get a special collector's edition release? Of course not. The only question was how 2K and Gearbox would go about commemorating the release of the most famously delayed videogame in history. The answer: with balls of steel! The Duke Nukem Forever Balls of Steel edition is one seriously impressive package. It comes with a bust of the man himself (that's some kind of bust, alright), a 100-page book entitled The History, Legacy and Legend: Duke Nukem Forever Art From the Vault, a series of postcards showing off a few of Duke's many accomplishments, a radioactive emblem sticker, a DNF comic book, DNF foldable paper craft, DNF poker chips, a deck of DNF playing cards and DNF radioactive emblem dice, all stuffed into a huge DNF box and accompanied by a numbered certificate of limited-edition DNF authenticity. And how much will all this mind-blowing Dukeness cost, you wonder? Amazon currently has the Balls of Steel edition listed at $99.99 for the Xbox 360 and PlayStation 3 and $89.99 for the PC, compared to $59.99 for the standard console release ($49.99 for PC.) Wow! That actually seems pretty reasonable. I just hope the game lives up to it. After 14 years in development, Duke Nukem Forever is finally coming out on May 6 for the PC, Xbox 360 and PlayStation 3.